The popular 90s sitcom “Friends” featured an episode where Ross and Rachel were trying to figure out how to end their alcohol-fueled marriage in Las Vegas. 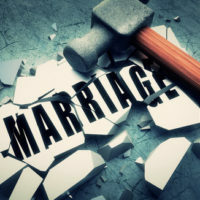 Ross brings up the option of annulment and describes it as a way to “make the marriage disappear as if it didn’t happen.” They later learn that it’s actually more complicated than that. The major distinction between a divorce and an annulment is how the marriage is treated in a legal context. An annulment effectively invalidates an improper marriage. In the context of divorce, the marriage was proper, but is ending by agreement between the spouses. Ross was actually correct, to an extent, that an annulment treats the marriage as though it never existed, but it was not legally valid to begin with. Probably one of the biggest differences between an annulment and a divorce is the burden of proof placed upon the party seeking an annulment. You need to affirmatively substantiate specific facts to meet the statutory criteria necessary for a court to grant an annulment. In divorce, the burden is much lighter for the parties. In fact, you could seek a no fault divorce which indicates that both parties are in agreement that a divorce is appropriate and are not assigning fault to either side. So, if you want to get an annulment, be ready to offer evidence demonstrating you meet the prerequisites set forth under Texas law. This is where hiring a Houston family law lawyer makes sense. Intoxication: If you testify that you were heavily intoxicated (either by drugs or alcohol) and this intoxication hindered your ability to agree to the marriage, the court may grant an annulment. However, intoxication is only a sufficient basis for an annulment if you did not live with your spouse after regaining your mental faculties. Impotency: If your spouse is impotent and was impotent when you got married, an annulment may be granted, but only if you had no knowledge of the impotency at the time of the marriage and you did not voluntarily cohabitate after learning of the impotency. Blood relatives: If you and your spouse are related too closely by blood (e.g., cousins), the marriage can be declared void by the court. Forced marriage: if you were induced or coerced into getting married, the court may grant an annulment, but only if you did not voluntarily cohabitate with the other party after being released from the coercion or inducement. Marriage to a minor: if the marriage of a person 16 years or older but under 18 occurred without parental consent or court order, the court may grant an annulment. Already married: If either you or your spouse was already married at the time of the marriage ceremony, the later marriage will be annulled by a court. As you can see, securing an annulment is not a walk in the park. It requires fact-specific evidence that meets the statutory requirements described above. This is why you should contact the Houston family law lawyers at Lindamood & Robinson, P.C. Our firm handles all types of family law matters including annulments and divorces.